The planned four-mile dual carriageway will complete what the government-owned company describes as ‘a missing link’ on the road, which is dualled either side of Arundel. The company said the scheme will create 'vital' extra capacity along the road and shave up to eight minutes off westbound journeys and 12 minutes off eastbound journeys. 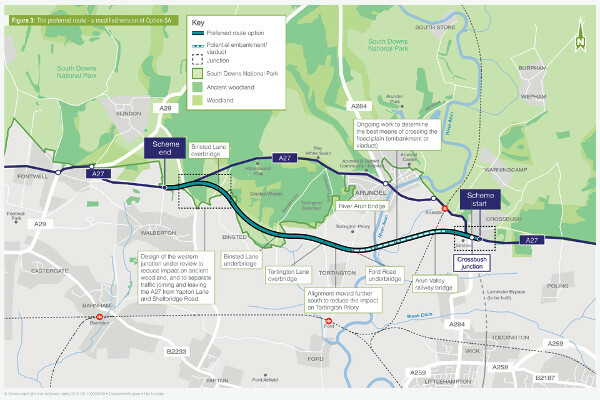 It said its preferred route, which is a variation of the 'Option 5a' that was put forward at a consultation last year, ‘strikes the right balance between creating vital new road capacity and protecting the special environment and cultural heritage in and around Arundel’. However, opponents of the project have warned of ‘strong resistance’. Alan Feist, Highways England A27 programme lead, said: ‘These ambitious plans will improve 21,000 journeys every day for drivers from Arundel and beyond. Stephen Joseph, chief executive of Campaign for Better Transport has previously said the scheme could become ‘a modern day Twyford Down’ – a reference to the hugely controversial extension to the M3 in the early 1990s. Reacting to the route announcement, he said: ‘By planning a dual carriageway through the South Downs National Park and ancient woodland, Highways England and the Department for Transport have shown that they don't care about all the fine words in Michael Gove's environment plan. ‘It is not even as if this destruction will actually solve the transport problems in the area. It will simply move the traffic jams down to the next bottleneck and will do nothing to give people choices in local travel. By contrast, local groups have produced a coherent alternative plan for the corridor which will actually help local travel without destroying the environment. Highways England said the scheme will also make journeys safer and support economic growth. It stated that there will be '177 fewer accidents than there otherwise would have been'. The consultation report has been published on Highways England’s website. The scheme is Nationally Significant and will require a Development Consent Order from the transport secretary.